If you're seeking to advance your career, or maybe enhance your career opportunities, then join us to learn about the various MBA programs. The College of Business is hosting an information session on May 17, 2018 from 5:45pm-7:00pm at the University Club. 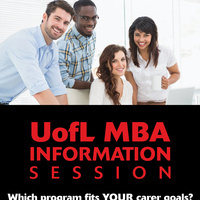 Register today at http://business.louisville.edu/ under events!